The concrete footing detail 1 below represents a spot footing detail. This is one of the most commonly used footing details that is widely used in both commercial and residential constructions. 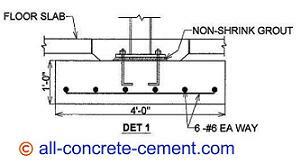 These concrete footing details can be found below a column (steel, wood, concrete, or CMU column) and in most cases at the interior of the building or house. The rebar in DET 1 is shown at the bottom of the footing indicating the load is downward. As this downward forces pushes on the footing, the bottom face will curve upward putting the bottom face in tension. That's the reason these steel reinforcements or rebars are at the bottom of the footing. If another layer of rebar is shown at the top of footing, it will indicate the column is subjected to uplift due to lateral load caused by earthquake or wind load. The line at the end of the slab that turns downward to cover the baseplate and anchor bolts means a block out is required. The diamond blockouts are often formed around the column locations prior to floor slab pour. These blockouts allow the floor slab to pour before the top of the structure is built. Some engineers require slip joint to be installed at the slab and the diamond blockouts. This can be achieved by installing a bond breaker such as tar paper or plastic liner at the edges of the slab prior to the pouring back of the diamond blockout. The loads in these columns can be tens of thousands of pounds. Such heavy loads tend to cause footing settlement over time. In the case of expansive soil when wet, the ground can push the footing and column upwards. By allowing the column slip down or up will minimize any substantial damages to the structure. 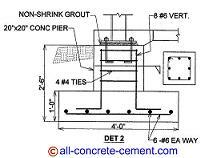 The concrete footing detail DET 2 is the exact same detail in Det 1 except DET 2 is for exterior footings. At areas where the ground is subjected to freezing, footings for buildings are required by code to be built below the frost line. This is usually achieved by dropping the footing down and extend it to the floor slab level with a concrete pier as shown in this detail. The size of the pier is often determined by the anchor bolt pattern to ensure the anchor bolts and baseplates fit within the pier. The biggest difference in footing construction for residential and commercial is the fact that most commercial structure are built with prefabricated material such as structural steel, metal building, precast concrete, prefabricated wood such as glulam, etc. All these prefabricated material require a precise locations of anchor bolts and embeds. Since most residential structure are build with wood, which are in most cases field cut to length and install, locations of anchor bolts and embed are not very critical.